Converts your car's power outlet into two USB ports, so you can charge two devices simultaneously. 2.1Amp QuickCharge USB ports for fast charging. Lightweight and compact. 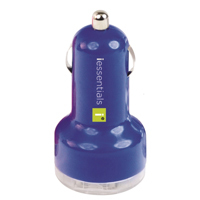 Compatible with most USB devices, including iPhones, iPods, iPads, tablets, smartphones, and mobile phones.